If you've watched Ratatouille (my absolute favorite animation ever, really, do I even need to tell you this? ), you'd remember that scene where the jaded, skeletal and grim-reaper-like restaurant critic Anton Ego tasted Remy and Colette's creation of that humble French Provencal dish and was instantly transported back to the back door of his mother's kitchen, bringing a smile to his otherwise permanently frowning face. 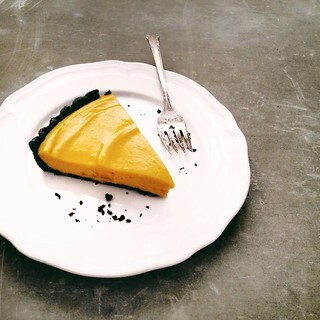 I experienced the same transporting power of loving food while learning how to crimp the traditional pineapple tart at Nazrah's mother-in-law, Neni Rose's kitchen months ago, after taking a bite off her neglected homemade marble butter cake. The cake was largely neglected because Naz used unsalted butter and didn't add salt to the batter. For me though, after the first mouthful, despite the lack of salt, I was back home at my childhood dining table, cutting into one of my mother's many cakes (including this one), not quite cooled from the oven, impatient with glee and greed for some delicious comfort. The buttery, fluffy vanilla cake interjected with bursts of rich, cocoa inserts was without doubt, the product of a traditional recipe, possibly passed down through generations, sourced from a completely unassuming 'makcik' (this is how we address homey, middle-aged Malay ladies here) somewhere. 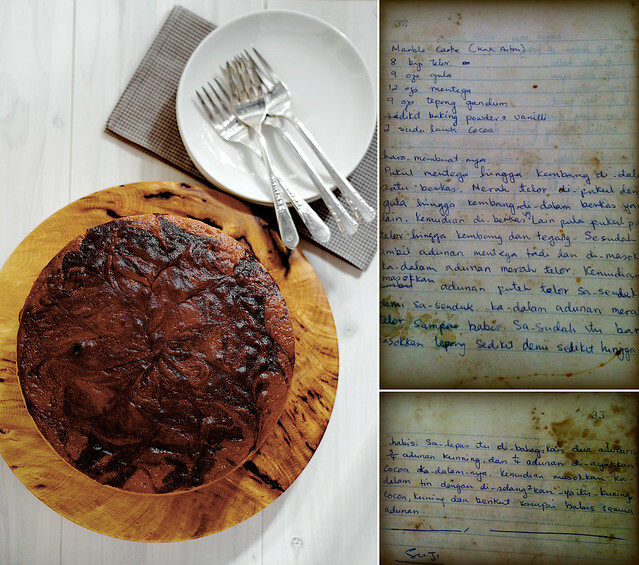 This is not me waxing lyrical just to convince you, for the recipe from Naz's MIL's dog-eared, heavily stained and almost falling apart notebook looked like this. So as soon as I downed a second piece of Naz's disappointment, I grabbed my phone and stole it in a total broad-daylight-robbery manner. Of course Naz and her (totally rocking) MIL were more than happy to share, just like Remy was. Written in old Malay, some of the ingredients were not even written in exact measurements, just like how some old French women don't really measure accurately when they baked. This was how our mothers and grandmothers wrote their priced recipes - 'sedikit' means 'a little' and 'sudu lauk' literally translates to 'serving spoon'. So you see, quite obviously, it would be a crime to allow something like this to be forgotten. Marble cake recipes are usually associated with the classic pound cake but I'm reluctant to call this a pound cake because not all the ingredients are in pound-to-pound ratio. This is, however, definitely a satisfyingly rich, buttery cake, with a base of which ignoring the cocoa, you can fiddle around with flavors like citruses, coffee and other things which your head would imagine having a great time with butter. If you've never made a marble cake before, don't let the whole marbling business give you any grief. The less you stress about it and just blob the batter around, the better it'll turn out. Don't have too much fun swirling with the skewer though. As my friend bakes her way through her mother-in-law's treasure, I reckon chances are high this recipe would make it to your own collection, waiting to be passed down to those whose bellies you've blessed. In my case, I'll be bringing back my own mother's tattered recipe book when I return to Kuala Lumpur this weekend. We'll see if I can bake through her book and do more of her recipes justice since her pandan chiffon already caused quite a storm. Recipe from Nazrah's mother-in-law, Neni Rose, who apparently got it from Kak Aiton. Note: You may convert the cake to your available tin size or even bake them in 2 loaf pans. Baking time will vary, I'd checked mine at the 40 minute mark (earlier if using loaf pans). I used salted butter and salt in my cake and didn't find it too salty. The ratio of chocolate versus vanilla batter is really down to your own preference; however it will be easier to achieve a nice marble effect with more vanilla batter so the 3:1 ratio worked well for me. I use two mixers (a KA and a hand held) for this cake - if you only have one, I'd suggest whipping the egg whites by hand and lose some calories you'd gain from the cake in the process. Preheat oven at 160°C (convection fan on) with a wire rack in the middle. Line an 8-inch round cake tin with parchment, butter and flour. Sift flour, baking powder and salt in a bowl. Set aside. Cream butter in the bowl of a stand mixer fitted with the paddle attachment till light and fluffy. In a separate bowl, whisk the egg yolks with the sugar till light. Gradually add this into the butter and beat on medium speed till just incorporated. In a separate bowl, with a hand mixer, whisk the egg whites till stiff peaks form. With a spatula, fold in the meringue into the egg yolk mixture in 3-4 batches. Add in the dry ingredients gradually until just incorporated. Divide the batter into two, 3/4 in one batch and the rest in another bowl. Sieve cocoa powder over the lesser batch and fold to mix well. Pour batter into tin, alternating between the two mixtures, starting with the yellow batter and ending with the cocoa mixture. Rap pan on counter several times to eliminate air bubbles. With a long skewer, swirl around the batter to create the marble effect. Bake for 40-55 minutes or until a tester inserted into the middle of the cake come out clean. Cool on wire rack completely before serving. 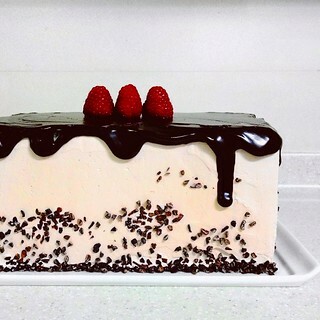 Cake keeps at room temperature up to three days and can be frozen up to 3 months. Pick yin! this looks absolutely fabulous. Can I take the whole cake please :D ! 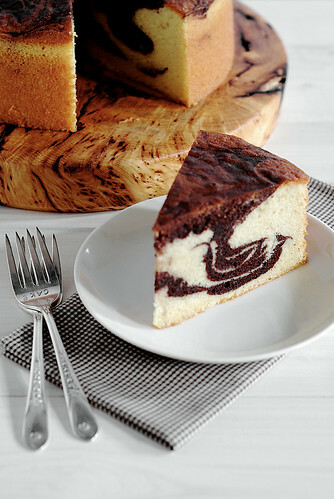 The marble cake pattern looks perfect! Wa looks so good. Never seen marble cake so pretty before! i can picture an afternoon spent with the ladies, crocheting/knitting, sipping on tea & snacking on this. Your marble cakes looks so perfect! I really want to try making it now. LOL talking about old recipe... I still remember camca oz (spoon), my mom measured everything with her camca oz. This looks like a really old recipe .. look at the paper it is written on! Gosh! But I do love a good marble butter cake, practically grew up eating this. It looks gorgeous and your marbling looks like a teapot design .. LOL. Oh Pick Yin! This is such a nice piece! My MIL will be so pleased to read this. 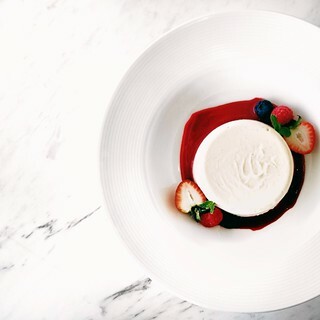 Thank you for gracing our humble kitchen with your keen eye and palate. I was going to bin my disappointing cake but somehow left it there on the kitchen counter,who knew you'd be interested to even give it a chance....thanks babe! Adrienne: Thank you. Hope to try your baked goods one of these days. Lan: Knitting I've never done, crocheting yes, your picture is so romantic. We actually just ate this cake while watching our favorite TV shows. Bwahahahah! Swee San: Thanks! Not perfect, still got room for improvement. Lisa: Is camca oz like an actual ounce measure? I'm intrigued. :D Hope you're keeping all your recipes in a notebook too for your kids! jo: Thank you. The notebook is old, some of the recipes are from her MIL's mother! I grew up eating this cake too, one of my favorites. Nazrah: I hope she likes it and I did her recipe justice. Also I hope the rest of that cake didn't get binned, if I knew I would tapau if off you! Lovely post and awesome photography! I might have to try this over the weekend. My dad loves simple cakes like this. All of us are eyeing this classic cake right now...thanks to Naz's MIL. in my studio: Hope this works out for you and your dad. Thank you! Resse: Yes, thanks to their generosity! Oh my goodness! I just discovered your website via 'Sips and Spoonfuls' and your amazing carrot cake with maple syrup. I'm smitten and can't wait to work my way through your archives. One big WOW to you! I have saved this recipe! :) Will be making it, and thinking of you. Love the cake love your photos. Way to go!! anh: You're so sweet. Let me know how it turns out! Carina: Thank you, hope you'll find something of your liking to make from my list. Wow. 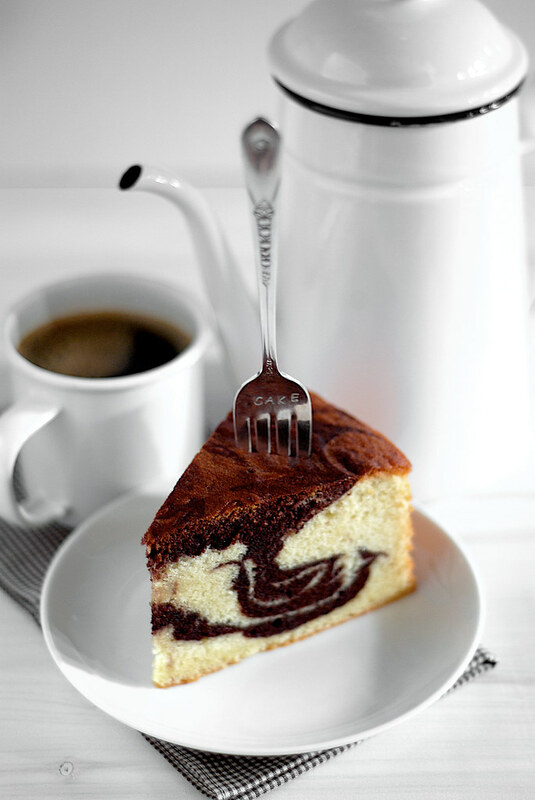 That's the most beautiful marble cake I ever seen. I've got to try it. zenchef: Thanks Stephane. You should, it's been tried and tested! Quay Po Cooks: Thank you! Actually that notebook is my friend Naz's MIL's. My mother has a similar one which I'm going to cook from as well. 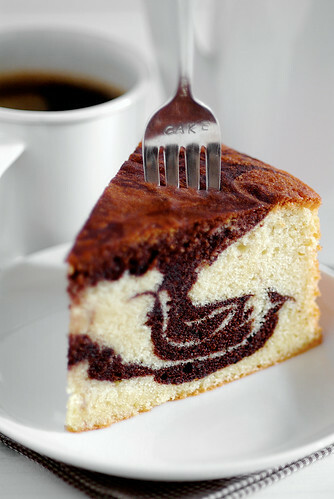 Wow your Marble Cake look geogous! I love the marble effect in the cake which makes it look like those genius "lamp". Ellena: Aladdin's lamp huh? Actually I was lucky. When I cut the other parts of the cake, the marbling effect was not as 'special'. Do try the recipe! 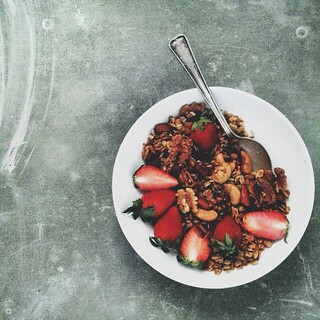 this looks so yummy and i love that fork too! Wow what an awesome cake. 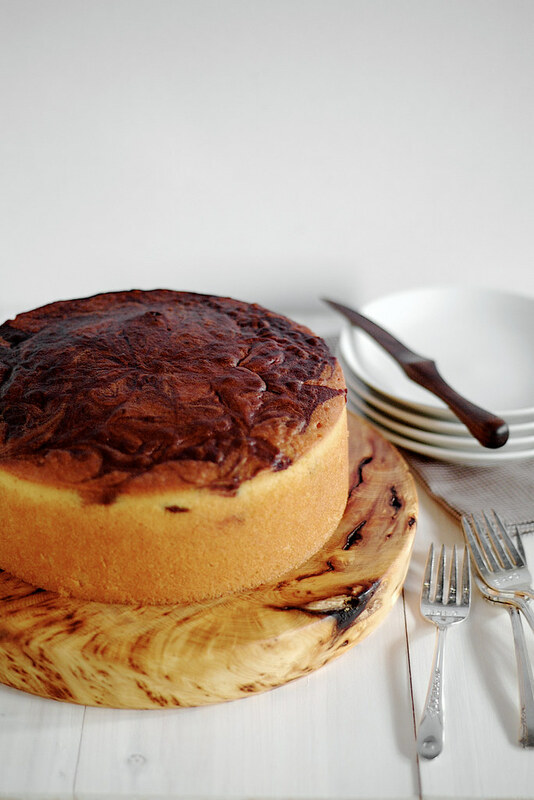 I have tried many marble cake recipes and this is by far, the BESTEST! I mixed by hand, and even then the cake texture was soft, supple and moist! At the end of tea time, more than half the cake was gone! anon: Thanks for trying, this is the cake for keeps. Traditional recipes are the best! Ker-Yng: It was pretty random actually. I just happened to cut at the correct place! Hey, thanks for sharing such a great recipe. I halved the ingredients as I only had four eggs but the cake came out delicious. This is my first time whipping my egg whites. The top of my cake was a bit holey, not sure went wrong but the texture was great. Fluffy, light and buttery. Thanks! The grains on your timber cake-stand so cleverly and beautifully mimics the marbling on the cake! May I ask where you got that cake stand from? Dixie: The holes on top are just trapped and exploded air bubbles. Tap your cake pan on the counter from a height a few times before putting it into the oven. Jo: I bought the stand online from Herriot Grace. Hi, i'm a novice in baking with the egg separation technique. I have tried baking this cake 3 times... Each time with a very slight improvement but never as beautiful as your's. Can you troubleshoot why my cake crumbs are never fine... In fact it taste rough. How does the batter looked like before going into thr oven? mooma: You mentioned a slight improvement each time you made this. Did you pay attention to the things you did differently each time? The batter should be mixed just enough, not over folded. The meringue is important here, beat is gradually to get finer aeration and incorporate it gently into the yolk mixture. All your ingredients (butter, eggs) should be at the room temperature. Well, I guess each time I spent a little more time folding it. I was afraid of over folding you see. Butter and eggs were in room temperature. I will try again. One other question, I store my cake in air tight containers at room temperature. However, the crust seems to turn sticky the next day. Is that normal due to our humid weather? Btw, I'm from Malaysia. mooma: It's not necessary to store cakes in airtight containers. They have to breathe. A cake dome is sufficient, failing that loosely tent with foil. If your crust is sticky then it's possible your batter has split slightly before going into the oven, therefore the butter separates out as the cake cools. The batter should be homogeneous and smooth. Hello PickYin, I'm a silent reader of your blog. I baked this marble cake in 2 loaf pans. They were very very good. I love the buttery taste and texture. Sweetness wise, just nice. Thank you for sharing the recipe. Such a beautiful cake! I poured over all your cake recipes, Pick Yin, before finally settling on this one to make over the weekend. I had to make it gluten-free to accommodate my celiac disease, and had great results - lovely crumb, moist, not too dense, perfect amount of sweet and salt, chocolate and vanilla. aly: Glad to hear this, how did you make it GF? Using GF flour? Pick Yin, thanks for your interest in the GF conversion! I substituted a mixture of GF flours of the same weight as the AP flour in your recipe (9 oz), then I decreased the quantity of eggs from 8 to 6 since GF baking doesn't require as much fat. 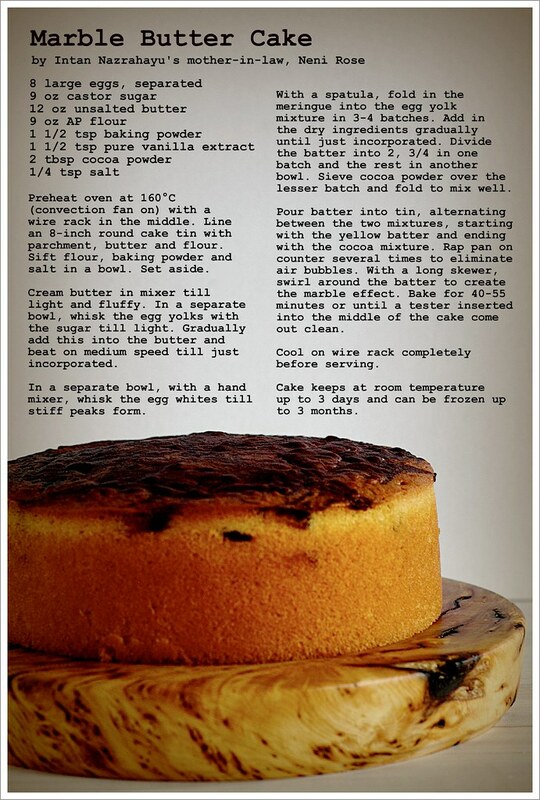 Here's what I did exactly, but when I bake this marble butter cake again I may even decrease the butter by 2-4 oz. just to further improve overall texture. Batter will be thin, and baked closer to 55 minutes in a 350°F conventional oven. aly: I asked because some GF readers might be interested. I always applaud GF bakers who can convert classic recipes like this! Anon: You're welcome, glad this turned out good for you! Thanks for the wonderful recipe ! Peng: Nicely done, glad it worked out for you! Hi thanks for the wonderful recipe! I tried baking the cake it turned out very nicely!! !just wondering is the cake batter suppose to be flowy or lumpy? Mine turned out very lumpy but despite that the cake is superb. Ghim Hui: It was probably because your meringue was edging on the dry side. The batter should be quite smooth. Hi rants4u, try baking your cupcakes at a lower temperature - 10C lower. As cupcakes have a smaller surface, it's most likely to crack by the time the center is cooked. Perhaps you may want to use another recipe to make the cupcakes. Most basic cupcake recipes can be marbled the same way. I've baked this 3x and I think my MIL loved me more when I gave her the cake the 2nd time I baked it (I received rave reviews from my colleagues the first time I baked it)! The recipe is simple, straightforward and almost fool proof. Thanks for sharing a recipe which may otherwise had gone 'undiscovered', thereby denying us a perfect tasting marble cake! I have a little question to ask of you though. My friend has asked me to bake this for the first day of the fasting month (I'm honoured that she trusts me, a non Muslim, to bake her cake) and has asked for a square version. What pan measurement should I use, given that it's an unconventional 8 x 3 inch pan that you used? Usually round pans are 2 inches high - I specially got a 3 inch one for this. MummyMOO: Glad this works for you! You can bake this in an 8" square pan. It still needs to be 3" high for safety and so that the cake can rise properly while baking. In general square pans of the same measurement can fill more batter. Hey can u pls give the recipe in grams. For the ones having trouble with the meringue folding step, I would suggest to add dry ingredients (flour base) and whites at the same time, same ratio. Quite like when making macarons, the dryness helps and you will less likely "kill" your batter by hard mixing your dry ingredients in your batter. In England,we do not add salt into our cakes. People add salt in America to their cakes. I think this is a regional preference. Marks and Spencer's cakes have salt and they really taste very bad and I think is because Marks' cakes are too sweet and they add salt to mask the sweetness. So, I would not say your friend Naz is wrong to use unsalted butter, which tastes a lot better than salted butter, and add no salt is wrong at all. It is all to do with regional / personal taste. Hello, thank you for the recipe...I tried to converting the OZ to cups/grams but I'm not sure I am getting the accurate measurements. Could you please list the flour/sugar in cups instead of oz? Thanks again. Hi you may wish to check on FB Alinah Binte Ali. She used your marble cakes' photos without credit..and her recipe is very different from yours. Apparently she has been caught using another blogger's curry puff photos as her own before. Hi PickYin. I had quite a bit of problem when I bake this cake. My cake batter looks like it curdled when I added the egg yolk mixture into the butter mixture. And it was very hard to fold the meringue into the batter. Is the batter supposed to look "curdled" after adding the egg yolk mixture into the butter mixture? Michelle: Such problem is quite common, to solve this simply add a bit of flour into the mixture before folding in the meringue. Ensure that your meringue is not too dry, and loosen the mixture with 1/3 meringue (whisk in freely) before folding in the rest. I don't have a convection oven, what would the temperature be for a regular conventional oven?